Recently a good friend and a fellow Crazy Crafter lost a beloved family member....(fur baby). My heart sank when I heard she was very upset. So I made her this to let her know I was thinking of her. 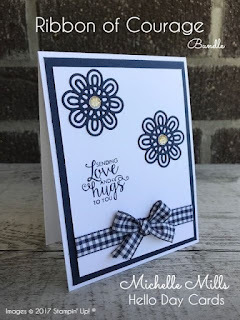 I LOVED this when I first saw it.......its a CASE of a Mary Fish creation over at Stampin' Pretty. I changed it up ever so slightly by using the Gold Faceted Gems for the centres of the flowers. This is the first time I have used the Gingham Ribbon and WOWSERS! Its beautiful. I'm not a ribbon lover and don't use it often on my cards but after using this particular ribbon, this may change in the future. My friend received the card and she loved it.